On September 7-8, 2013 the 3rd annual Moron’athon took place. 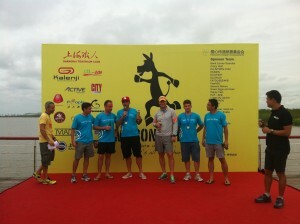 The Moron’athon is the first 24 hour ultra-marathon relay held in Shanghai. Teams of 4-6 runners take turns completing 5k laps over a 24-hour period. In all, there were over 600 runners competing in the 24-hour relay event that benefited the “Pass Love Charity Foundation” that helps establish quality libraries in poorest areas of China to help rural children and teachers. Dan Krassenstein is Procon Pacific’s Director of Asian Operations and based in Procon’s Shanghai office. He has participated every year since the inception of this charity fund-raiser. Award categories ranged from fastest 5K (17 minutes), longest distance by an individual runner in 24 hours (equal to 4.4 full marathons) and which team raised the most money for the PLCF Charity (which Dan and his team won for the third year straight). Dan himself raised over US$4,400 and ran 40km. Even though there are reports of blistered feet, bruised toes and tired bodies, all involved agreed that it was well worth it. Congratulations to Dan and his whole team! !